The Cowboy Costume was first released in February 2009 in Account Upgrades and the costume has been retired and forgotten about ever since. We have updated and renamed the costume and a new version of the Cowboy Account Upgrade has been released, with 8 new themed items. A new Bootleg Pyramid Treasure Map is the main prize. Collect all 16 pieces of this map and you will gain access to the brand new Bootleg Pyramid feature recently released. You will receive 6 or 7 random pieces of this map. There is a 1 in 3 chance you will receive 7 pieces instead of 6 pieces. This AU will retire November 15th. The Addow, Astro, Chibs, Decadal, Kujo, Raulf, Rusty and Sybri can now wear the Cowboy Costume. The original eight Cowboy pets have been updated. 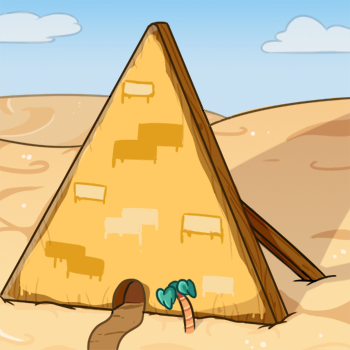 A new Pyramid has opened in the Kamilah Desert. Complete all 16 pieces of the Bootleg Pyramid Treasure Map from the new Cowboy Account Upgrade set to gain lifetime access. This ancient Bootleg Pyramid has 50 levels inside. While inside the pyramid, your pet will see ancient symbols on the walls or floor which will help him safely proceed to the next level. But you will need Fake Hieroglyphics to help translate. At each level of the Pyramid, you will get a prize. It can be either items, currency, pet stats or Account Upgrade Credit. There is no time limit for completing the Pyramid, but you can only complete one level every 8 hours. If you manage to reach level 50, you will be able to add a missing Book, CD or DVD to your pet's collection! 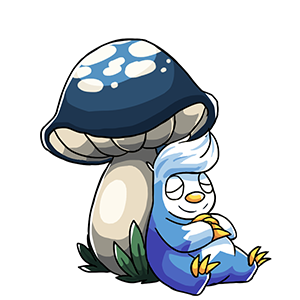 A new Native Fairy prize has been added for those who have completed 20 maps, instructions or passes. Can you find the new 'Bootleg Pyramid' Hidden Avatar? A new Weekly Quest Contest has just started. This week's quest game is Puchalla Inn. The challenge is to complete as many of these Quests this week. The top 3 players at the end of the challenge will receive a Dark Costume, 200,000MP and a Gold Trophy, the next 6 players will receive 150,000MP and a Silver Trophy and the next 9 players will receive 100,000MP and a Bronze Trophy. A new Weekly Battle Contest has just started. This week's opponent is Rusty Twins. You will need to have a Rusty Twins Trading Card in your Battle Deck. The challenge is to win as many battles against this opponent this week. The top 3 players at the end of the challenge will receive a Shelley Trading Card, 200,000MP and a Gold Trophy, the next 6 players will receive 150,000MP and a Silver Trophy and the next 9 players will receive 100,000MP and a Bronze Trophy. The Lottery has been drawn for this week. Cappygirl is the winner of the 669,700MP Jackpot with the winning numbers of 2, 4, 10, 25, 32 and 40. Congratulations! Last Week's Raffle has now ended. karenmp is the winner of the Red DNA and 100,000MP prize with the winning raffle ticket number 511845. Congratulations! Make sure you buy your tickets for today's raffle - only 10MP per ticket! The Game of the Week has changed to Moon Racoons and this week's Olympics Event is Hurdles. The Mission of the Week has now changed. Earn 50% more MP completing levels of Pirate Mafia this week. Voting has closed and a new Shop of the Week has been decided. For the next 7 days, the School Supplies shop has a 2 for 1 sale. Every time you buy an item from this shop you will pay for one and receive two. Vote Now for next week. All pets wearing a Black Costume will receive Double Training stats this week at the Gym and Elite Gym. Vote Now for next week. All pets wearing a Dalmatian Costume will receive Double Education stats this week at the School and University. Vote Now for next week. The August 2018 Monthly Checklist winners have been announced and the prizes have been rewarded. Congratulations to all of those who have won. Don't forget, this is a monthly permanent feature that you can enter for FREE. If you haven't already, it's time to start entering the September event! The Raulf, Sindi, Ushunda, Walee and Zoink can now wear the Slime Costume. A new Weekly Quest Contest has just started. This week's quest game is Eleka Prison. The challenge is to complete as many of these Quests this week. The top 3 players at the end of the challenge will receive a Fancy Costume, 200,000MP and a Gold Trophy, the next 6 players will receive 150,000MP and a Silver Trophy and the next 9 players will receive 100,000MP and a Bronze Trophy. These new limited edition Account Upgrades items have been added for our Birthday. They will retire September 10th. These new Hidden Avatars have now been released. These new prizes have been added to the Birthday Events. A new Weekly Battle Contest has just started. This week's opponent is Murderer. You will need to have a Murderer Trading Card in your Battle Deck. The challenge is to win as many battles against this opponent this week. The top 3 players at the end of the challenge will receive a Conker Trading Card, 200,000MP and a Gold Trophy, the next 6 players will receive 150,000MP and a Silver Trophy and the next 9 players will receive 100,000MP and a Bronze Trophy. The Lottery has been drawn for this week. Toshiyori63 is the winner of the 296,100MP Jackpot with the winning numbers of 7, 17, 24, 30, 43 and 44. Congratulations! Last Week's Raffle has now ended. flojo35 is the winner of the Red DNA and 100,000MP prize with the winning raffle ticket number 502469. Congratulations! Make sure you buy your tickets for today's raffle - only 10MP per ticket! The Game of the Week has changed to Fruit Harvest and this week's Olympics Event is Swimming. The Mission of the Week has now changed. Earn 50% more MP completing levels of Bumpkin this week. All pets wearing a Olive Costume will receive Double Training stats this week at the Gym and Elite Gym. Vote Now for next week. All pets wearing a Ice Costume will receive Double Education stats this week at the School and University. Vote Now for next week. Our 14th Birthday Party celebrations have finally started. We have 2 new events that will run until September 15th. Our 14th Birthday Party has started! We need your help inviting as many online players to the fun! Visit a user's profile and hit the 'Happy Birthday' button and they will be invited to the party. Each player is different - some won't party, some will and others will have the best time ever! The respone of the character will depend on what prize you receive. You can only invite a player who is currently online and can only invite the same player once every day. Each player can only be invited once every 30 seconds. You will receive MP or one of 25 new Pinatas as a prize. As you browse and play the site as normal, a 'Birthday Gift' may show up in a box. When you find it, click it and you are guaranteed a prize! You can win all of these new Gift Bags below, MP and if you're lucky, Account Upgrades Credit! At the end of the event, the top 100 players who collect the most gifts will receive 1,500,000MP and a Party Monster Trading Card! The next 300 players will win a Party Monster Trading Card. 15 random players who find 100 or more Gifts will also randomly win a retired Party Costume. Posting the 14th Birthday Balloon Box image on profiles, siggies, etc is confusing to other players and, as usual, is not allowed. If you are asked to remove the image and do not do so, your account may be frozen until the end of the 14th Birthday celebrations. We would like to thank you all for your patience the past couple of weeks while we completed our Server Maintenance. It is now finished and was a complete success. We can now continue as normal with new updates, with the Birthday Events due to start tomorrow. For a limited time only, the retired Virgo Treasure Chest is back on sale at the Account Upgrades Shop. It will all automatically retire September 10th. The Crindol, Ercuw, Kronk, Limax and Rusty can now wear the Checkered Costume. The Lottery has been drawn for this week. mymysweetiepie is the winner of the 488,400MP Jackpot with the winning numbers of 5, 11, 16, 19, 21 and 27. Congratulations! Last Week's Raffle has now ended. gabbygirl95929 is the winner of the Red DNA and 100,000MP prize with the winning raffle ticket number 492138. Congratulations! Make sure you buy your tickets for today's raffle - only 10MP per ticket! The Game of the Week has changed to Klondike Solitaire and this week's Olympics Event is Hurdles. The Mission of the Week has now changed. Earn 50% more MP completing levels of Blitzen's Grotto this week. Voting has closed and a new Shop of the Week has been decided. For the next 7 days, the Computer Parts shop has a 2 for 1 sale. Every time you buy an item from this shop you will pay for one and receive two. Vote Now for next week. All pets wearing a Plushie Costume will receive Double Training stats this week at the Gym and Elite Gym. Vote Now for next week. All pets wearing a Pixie Costume will receive Double Education stats this week at the School and University. Vote Now for next week. A new Weekly Battle Contest has just started. This week's opponent is Hi Tech Sybri. You will need to have a Hi Tech Sybri Trading Card in your Battle Deck. The challenge is to win as many battles against this opponent this week. The top 3 players at the end of the challenge will receive a City Mayor Trading Card, 200,000MP and a Gold Trophy, the next 6 players will receive 150,000MP and a Silver Trophy and the next 9 players will receive 100,000MP and a Bronze Trophy. A new Weekly Quest Contest has just started. This week's quest game is Hump Racing. The challenge is to complete as many of these Quests this week. The top 3 players at the end of the challenge will receive a Cotton Candy Costume, 200,000MP and a Gold Trophy, the next 6 players will receive 150,000MP and a Silver Trophy and the next 9 players will receive 100,000MP and a Bronze Trophy. We have been working our hardest to fix the Server Issues we are having AND keep the site open at the same time. However, the lag is really annoying for us all and the maintenance will be completed a lot quicker with the site taken offline. We have made the decision to close the site for 3-4 days to complete the maintenance much, much faster. Later today, the site will be going offline. We will keep you updated with our progress on our Facebook page and will start our Birthday Events as soon as this is completed. Thank you for your patience and understanding. A new Weekly Quest Contest has just started. This week's quest game is Candy Tree. The challenge is to complete as many of these Quests this week. The top 3 players at the end of the challenge will receive a Phantom Costume, 200,000MP and a Gold Trophy, the next 6 players will receive 150,000MP and a Silver Trophy and the next 9 players will receive 100,000MP and a Bronze Trophy. A new Weekly Battle Contest has just started. This week's opponent is Snot Newth. You will need to have a Snot Newth Trading Card in your Battle Deck. The challenge is to win as many battles against this opponent this week. The top 3 players at the end of the challenge will receive a Queen Eleka Trading Card, 200,000MP and a Gold Trophy, the next 6 players will receive 150,000MP and a Silver Trophy and the next 9 players will receive 100,000MP and a Bronze Trophy. The Lottery has been drawn for this week. ThaiHottie is the winner of the 548,000MP Jackpot with the winning numbers of 5, 6, 12, 27, 35 and 38. Congratulations! Last Week's Raffle has now ended. Ullakkopeikko is the winner of the Red DNA and 100,000MP prize with the winning raffle ticket number 482962. Congratulations! Make sure you buy your tickets for today's raffle - only 10MP per ticket! The Game of the Week has changed to Hexxagon and this week's Olympics Event is Swimming. Voting has closed and a new Shop of the Week has been decided. For the next 7 days, the Minipet Food shop has a 2 for 1 sale. Every time you buy an item from this shop you will pay for one and receive two. Vote Now for next week. All pets wearing a Navy Costume will receive Double Training stats this week at the Gym and Elite Gym. Vote Now for next week. All pets wearing a Space Costume will receive Double Education stats this week at the School and University. Vote Now for next week. A new Weekly Quest Contest has just started. This week's quest game is Queen Bee. The challenge is to complete as many of these Quests this week. The top 3 players at the end of the challenge will receive a Love Costume, 200,000MP and a Gold Trophy, the next 6 players will receive 150,000MP and a Silver Trophy and the next 9 players will receive 100,000MP and a Bronze Trophy.